Creating my everyday: Summer is tiring! 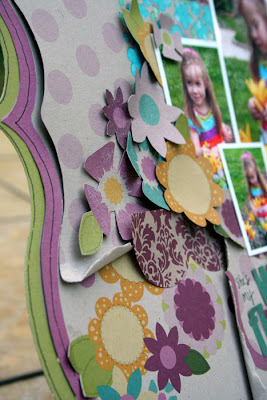 I have a new Fancy Pants layout to share using the gooorgeous new That Girl Kraft Kuts line. I covered up the flower paper with the polka dot paper and then tore it open to reveal the flowers. I then handcut a bunch of flowers (which I covered in glitter)and layered them on top. Speaking of Fancy Pants, I just got word yesterday that the new lines are shipping to us tomorrow - whoo! I'm so excited to play with the new stuff and make some designs for CHA. I reaaaaly wish I was going to CHA - one of these years i'm determined to go! I hear ya! I love the new LO, and can't wait to see what FP has in store for CHA! I got the mag, thanks so much! Very cute! I'm working with this line right now too. i love this one! and i don't even like purple! you and me . . . roomies at winter cha!!! i had totally planned on going this summer and then it turned out to be the first week back for teachers. argh! so totally planning on trying for this next one! Those photos of Chloe just pop with all of the purple background!! So adorable, Staci! I so wish you were going to CHA! This is my first time going and I am excited! thanks for stopping by my blog. :) i'll def be back to yours. I think you talked me into buying this line next time I'm at my LSS! Absolutely adorable! I'm jealous! I wish I was getting a big box of new FP being sent my way! :) I know you'll put it to good use! Can't wait to see what all you create. I love your new page!! !very cute!! Wonderful job with the Fancy Pants, girl! I'm totally hearing ya on the summer thing. I traveled over the 4th weekend and I'm heading out of town again Wednesday. Loving the down time, but who knew relaxation could be so exhausting! Enjoy while you can. Before you know it, we will be bemoaning the cold weather! Have a wonderful weekend. Love how you framed you LOs--just gorgeous! I will be at CHA and can't wait to see your stuff in person--although I wish I was seeing you too! I love love this layout - and just so you know - i have it in my hot little hands and your going to DIE!! It is so yummy! Hey maybe - we can meet up at Winter CHA - im hoping to get back then! Oh Staci, I love this new line! Beautiful layout and I just love the pics you always get of Chloe...She is getting so big!!! Glad you are having a great summer! oh i love all that purple and chloe is such a doll! i know what you mean about summer. i am exhausted, lol! Absolutely gorgeous!!!! How fun to play with the new fancy pants!! You rocked it girl!! Summer is tiring but at least y'all are spending your time well! it'll be over soon. 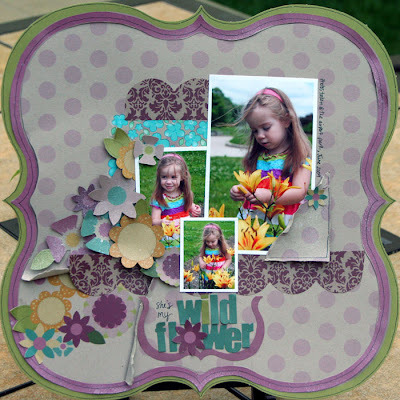 love how you did this layout - you make scrapping with purple look easy!!!! LOL and I LOVE the layout below of Chloe dancing! how stinkin cute is she?? ?